G350.1-0.3: Remnant of an Explosion With a Powerful Kick? G350.1-0.3 is a young and exceptionally bright supernova remnant about 15,000 light years from Earth. Its unusual shape suggests that the debris from the supernova explosion is expanding into a nearby cloud of cold gas. Astronomers think the star that created G350.1-0.3 exploded between 600 and 1,200 years ago. Vital clues about the devastating ends to the lives of massive stars can be found by studying the aftermath of their explosions. In its more than twelve years of science operations, NASA's Chandra X-ray Observatory has studied many of these supernova remnants sprinkled across the Galaxy. The latest example of this important investigation is Chandra's new image of the supernova remnant known as G350.1-0.3. This stellar debris field is located some 14,700 light years from the Earth toward the center of the Milky Way . Evidence from Chandra and from ESA's XMM-Newton telescope suggest that a compact object within G350.1-0.3 may be the dense core of the star that exploded. 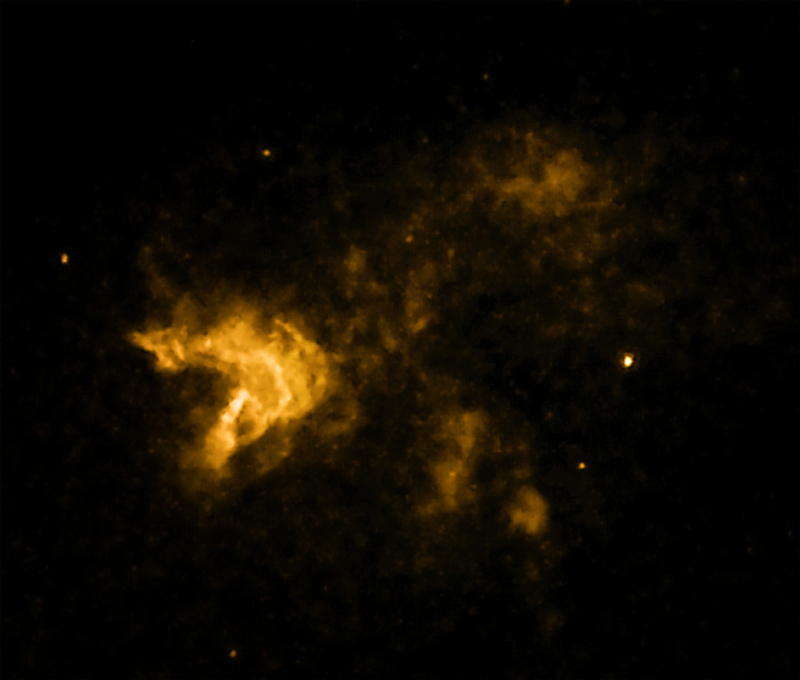 The position of this likely neutron star, seen by mousing over the image above, is well away from the center of the X-ray emission (mouse-over for this position). If the supernova explosion occurred near the center of the X-ray emission then the neutron star must have received a powerful kick in the supernova explosion. Data from Chandra and other telescopes suggest this supernova remnant, as it appears in the image, is between 600 and 1,200 years old. If the estimated location of the explosion is correct, this means that the neutron star has been moving at a speed of at least 3 million miles per hour since the explosion This is comparable to the exceptionally high speed derived for the neutron star in Puppis A and provides new evidence that extremely powerful "kicks" can be imparted to neutron stars from supernova explosions. Another intriguing aspect of G350.1-0.3 is its unusual shape. While many supernova remnants are nearly circular, G350.1-0.3 is strikingly asymmetrical as seen in the Chandra data in this image (gold). 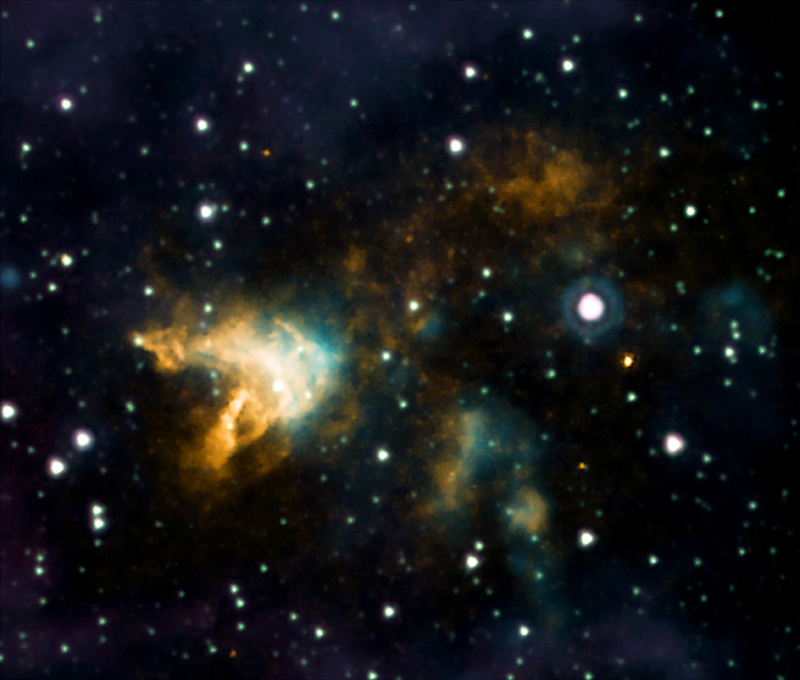 Infrared data from NASA's Spitzer Space Telescope (light blue) also trace the morphology found by Chandra. Astronomers think that this bizarre shape is due to the stellar debris field expanding into a nearby cloud of cold molecular gas. The age of 600-1,200 years puts the explosion that created G350.1-0.3 in the same time frame as other famous supernovas that formed the Crab and SN 1006 supernova remnants. However, it is unlikely that anyone on Earth would have seen the explosion because of the obscuring gas and dust that lies along our line of sight to the remnant. These results appeared in the April 10, 2011 issue of The Astrophysical Journal. The scientists on this paper were Igor Lovchinsky and Patrick Slane (Harvard-Smithsonian Center for Astrophysics), Bryan Gaensler (University of Sydney, Australia), Jack Hughes (Rutgers University), Stephen Ng (McGill University), Jasmina Lazendic (Monash University Clayton, Australia), Joseph Gelfand (New York University, Abu Dhabi), and Crystal Brogan (National Radio Astronomy Observatory). Coordinates (J2000) RA 17h 21m 03.00s | Dec -37° 26´ 50.00"
That is a tremendous speed for the star to atain from the explosion. How does this blast effect the star (besides it attaining a very high speed)? If it does have planets in orbit how would this effect them? Is the speed given the star instinanious or is it gradual? The bullet point "Astronomers think the star that created G350.1-0.3 exploded between 600 and 1,200 years ago" is a shortening of the fuller point made below: "Data from Chandra and other telescopes suggest this supernova remnant, as it appears in the image, is between 600 and 1,200 years old." Light from this remnant indeed takes about 15,000 years to reach us, but if we'd been observing with sensitive instruments (especially ones that detect neutrinos) between 600 and 1,200 years ago we would have seen evidence for the supernova explosion. In the description of the supernova G350.1-0.3 which is stated to be 15000 light years away it would not be possible to see it if it only went supernova 600 -1200 years ago. If the star is 14,700 light years away, how is it possible to see the results of an event that occured only 600 - 1200 years ago? A supernova remnant located about 14,700 light years from Earth toward the center of the Milky Way. About 14,700 light years from Earth. About 22 light years across. X-rays are gold, Infrared in cyan, purple & green.